Spring is on the way! So that calls for spring recipes, yup. Whenever I think of spring recipes two things come to mind. Lemon and chocolate. AM I right? These lil babies are seriously good, satisfying and refreshing all in one. If you love a pinacolda type vibe then I'd highly suggest you try them. 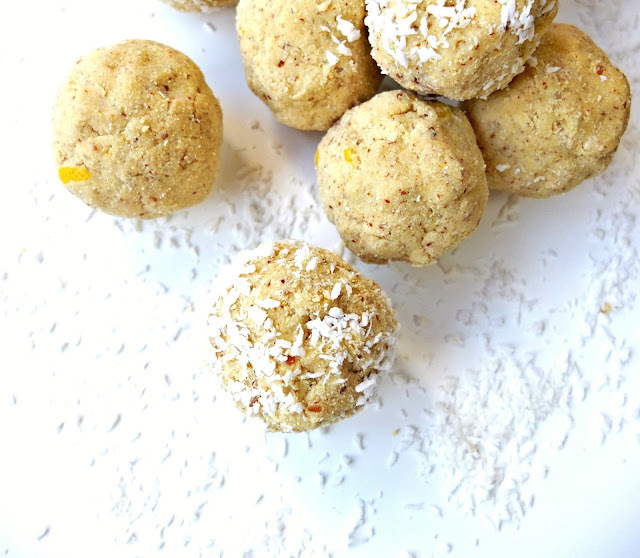 They're made with coconut flour and ground almonds which are full of healthy fats, vanilla vegan protein powder to pump up the protein, fresh lemon juice and zest giving them the perfect zing, coconut oil binding them together while adding more coconut hints and a little turmeric for a bright colour as well as it's anti inflammatory purposes. They are completely irresistible and full of amazing health and nutritional benefits. What's even better is you can simply pop all the ingredients into one big bowl, mix it all up and you're done. Super simple, easy and no messing! I mean that's what we want with snacks right? Place your almond in a food processor/highly powered blender and blitz until they're a powder. 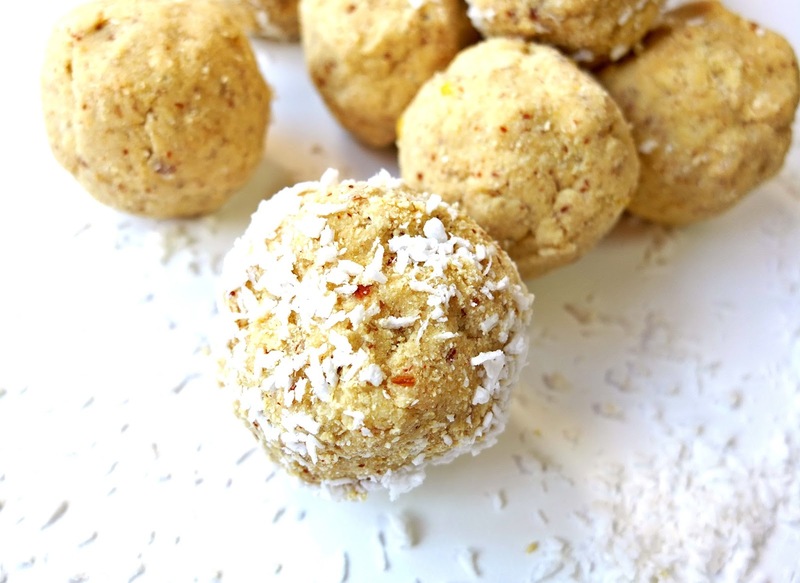 In a large bowl place the coconut flour, ground almonds, protein powder, salt. Zest in your lemon and squeeze in half a lemon. Then add your coconut oil and agave/maple syrup, stir them in. Gradually add your almond milk into the mix until everything is fully combined. If the mix is too dry add more milk. This mix should be not too sticky but enough that you can roll into balls. Take a handful of the mixture and roll into evenly sized balls. Roll into the desiccated coconut if using. Place into the freezer for 10 - 15 minutes until stuck together. Store in the fridge for 4-5 days or the freezer for up to 3 weeks.